It is nice and big and it’s very light, you can open the bi-folds and play outside. I love our led lights and our speakers so I can dance to them at night when we’re having a party. When I get older I would love to have an orangery for my children in my house. If you want a spectacular Orangery in Mansfield then you have most definitely come to the right place. We pride ourselves in designing and creating an orangery around your specific requirements. 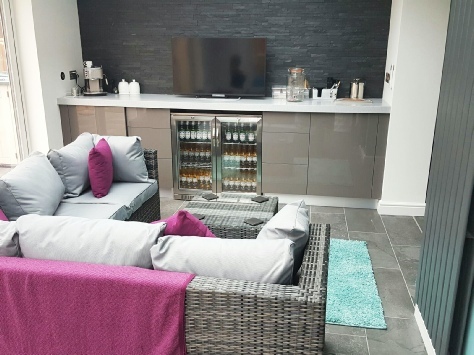 Do you want to open up your house and run a new kitchen into your orangery, create that wonderful inside/outside space with gorgeous bi-fold doors or simply just want to create some additional living space with your orangery? Mansfield Property Solutions are the right choice for you. We offer quality products including K2 orangery roofs, bi fold doors and bespoke kitchens all fitted by time served experienced tradesmen. Over 90% of our work comes from repeat business or recommendations in Mansfield. We think that says more about the standard of our work than anything else. 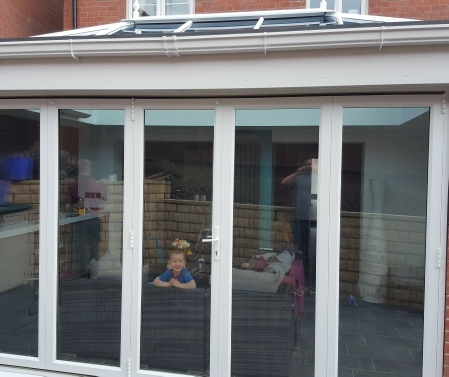 Orangeries are becoming more and more popular in and around the Mansfield area providing all the benefits and light of a conservatory combined with the all year round use of an extension. You really do get the best of both worlds. K2 Orangery roof with remote controlled led lights set around the bottom of the glazing to give a fantastic effect. When combined with the latest Bose in ceiling speakers it creates a truly breathtaking effect for parties. Bi-folds bring the outside in and really help connect your property with the outside. Orangeries really do offer the best of both worlds for property owners looking to achieve light, open spaces whilst not suffering the potential pitfalls of a conservatory which is too hot in the summer and too cold in the winter. With more wall/roof space than a conservatory, an orangery can be better controlled for a more comfortable all year round usable space. Inset Bose Virtually Invisible 791 MkII in ceiling speakers. High gloss grey custom made bar, solid surface worktop. Commercial grade double door stainless steel bottle fridge. Kitchen and dining room wall knocked through. Split face wall tiling above bar. Air conditioning mounted on the orangery bulkhead. Tablet control for all electrics. Recessed led under lighting to the solid surface worktop. Remote control colour changing LED mood lighting. 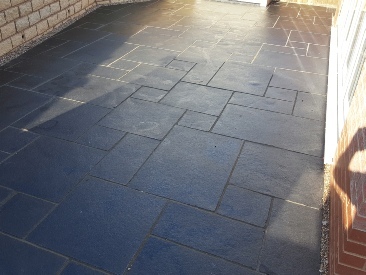 Outdoor patio to complement the colour of the floor tiles inside the house. Bringing the outside in! Wow what a view. 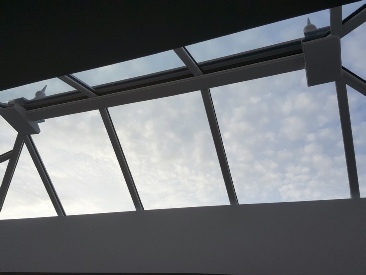 Lay your head back, look up to beautiful view in an orangery provided by MPS. Nothing but blue skies ahead! This large orangery was supplied with 5 door bi-folds allowing the whole house to be opened up on sunny days. Remote controlled, colour changing LED mood lighting around the edge of the K2 orangery roof. Top of the range inset Bose speakers - we re-enforced the soffit to take the movement from these speakers and ported the timber in the soffit to maximise performance. 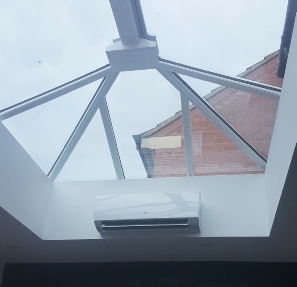 Heat exchanger/air conditioning mounted on the bulkhead of the orangery is a fantastic cost effective solution to provide any additional heat/cooling required. Commercial grade stainless steel double door bottle fridge. 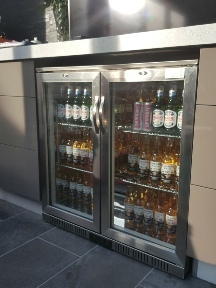 This customer likes his beer cold and we can confirm this is a rare bottle fridge that delivers 0 0C ice cold beer - of course we needed a test sample! 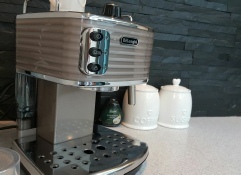 Worktop coffee machine provides beautifully fresh barista style coffee, to be enjoyed in the orangery with a morning paper/croissant. 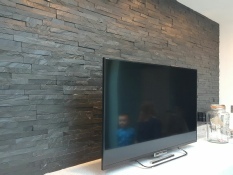 Split face tiles on the wall above the orangery bar provide a stunning contemporary finish worthy of a 5 star London hotel. We are a family business with over 25 years in the trade. We only employ qualified, time served fitters to install your chosen brand of orangery product. Mansfield Property Solutions will only recommend the very best orangery products to suit your needs and of course we pass on the manufacturers guarantee. We are also FENSA registered for complete peace of mind. With a great deal of glazing options available for different styles of orangeries MPS always has something to offer for both you and your property. Matching existing products you already have or coloured/lead glass we can do it all. We install toughened safety double glazing in all the orangeries we install that comply with current building regulations if required. Self cleaning glass - we kid you not! We can offer Pilkington Activ Clear with a unique dual-action coating that uses rain and sunshine to help keep the glass clean. Orangery solar control, self cleaning glazing provides great self-cleaning abilities along with superb solar control allowing you to stay cooler in your orangery. In general your orangery should not require planning permission or building regulations. Adding an orangery to your home is usually considered to be permitted development, not needing planning. There are however certain limits you can't exceed which we would be happy to advise you on. Orangeries are also normally exempt from building regulations again subject to certain conditions. Mansfield Property Solutions offer a complete turn key service for orangeries. We can handle as little or as much as you would like us to on your project. We can offer everything from design and conception of your orangery to completion of the finished project handed over to you on time and on budget. 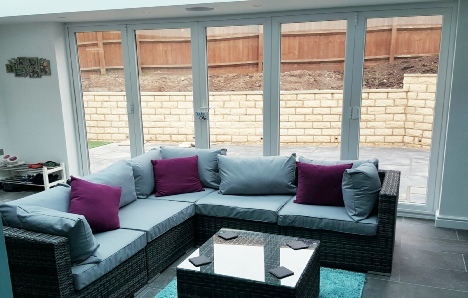 Our skills allow us to carry out any landscaping works needed, concrete base/foundations, bi-folds, K2 roofs, all glazing, electrics, plumbing, plastering, tiling we can do it all to provide you with your dream orangery. We can even fit you a custom made bar in there too if you want!